Sometimes I feel that I need greater creative focus. You know how it is: I have limited time and energy, so whatever I can get done isn’t going to amount to much unless I focus on getting one thing done–all the way done–before moving on. Besides, I feel guilty whenever I find a half-finished and now-forgotten art project in a drawer or cabinet, all alone like an orphaned child. Yet although I want to focus, there are times when I just can’t seem to make it happen–the line from the start of a project doesn’t seem to lead straight to its completion. For example, a while back Fran posted pictures of some of the stamps she carved by hand on her blog. They were wonderful, and I immediately remembered that I loved to carve stamps myself and that I had some Staedtler MasterCarve blocks ready and waiting in my art stash. I quickly got them out, put them on my desk, and started thinking of what to carve. But that was back in October! And when did I finally carve that stamp? Just four days ago. I got tired of those blank carving blocks staring at me whenever I sat at my desk to work on another journal page or watercolor or drawing. 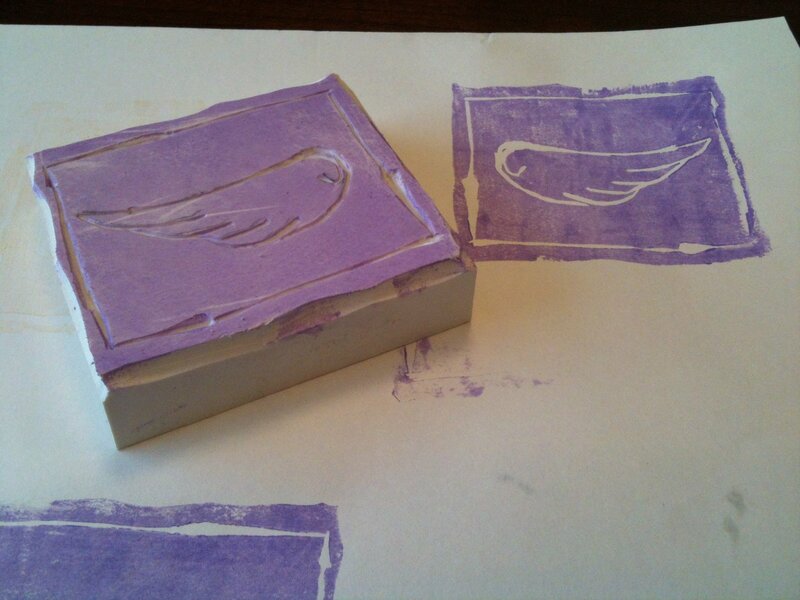 “I have done so much–why haven’t I made time to carve a stamp?” I kept asking myself. Since I had no good answer (except that “lack of focus” thing), I did one stamp–had a lot of fun, by the way!–and put the other uncarved blocks away because I have way too much going on. 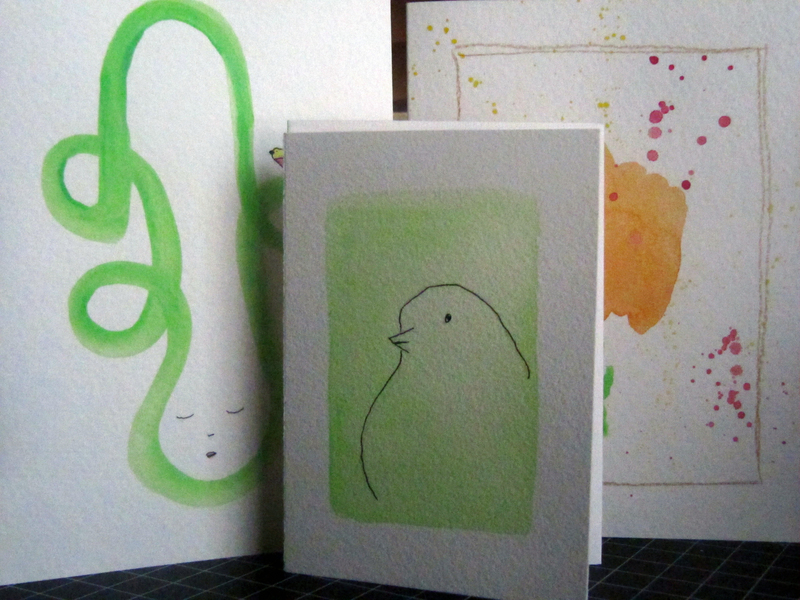 I’m trying to make some cards to sell and maybe set up an Etsy account, remember? In the end, I decided that I would compromise with myself this way: do something toward finishing one long-term project, then do something else that I just randomly want to try. (This makes these side projects seem move like a diversion than a distraction.) So this morning I photographed about half the cards I plan to offer for sale and, once that was done, I treated myself to some time with the new Inktense pencils. (Everyone says these are great, and they really are! So creamy to draw with, such bright colors when wet!) I hope that I may have found a balance between chaos and control, focus and randomness… we’ll see! After all, a quick count reveals that I have more than 30 books downloaded to my e-reader–none of them finished–yet. As promised, here are some of the cards I am working on to, perhaps, sell. Enjoy! 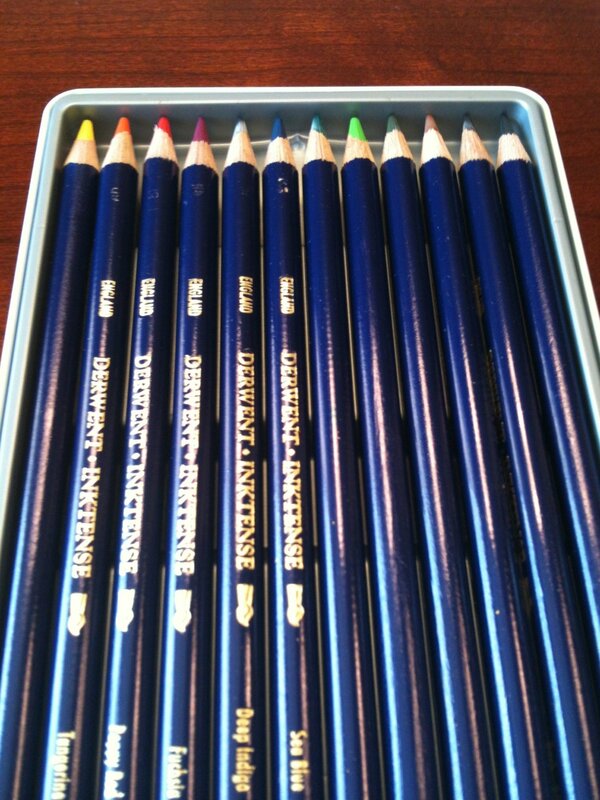 If these look familiar, it's because I raided my art journals for design ideas! Right now, each is in a plastic sleeve for protection. Here in Texas, it’s spring. I’ve shed my sweaters, the boys can’t be kept inside, and, on Friday, our dog slipped the surly bonds of the backyard fence to run off for a few hours. Yes, we all have a bit more energy. My mind has wandered, too, returning to an idea I’ve had many times before: making artwork to sell. Yet–do I dare? Friends have told me that I could do it simply because I make artwork that they, themselves, would be willing to pay for. 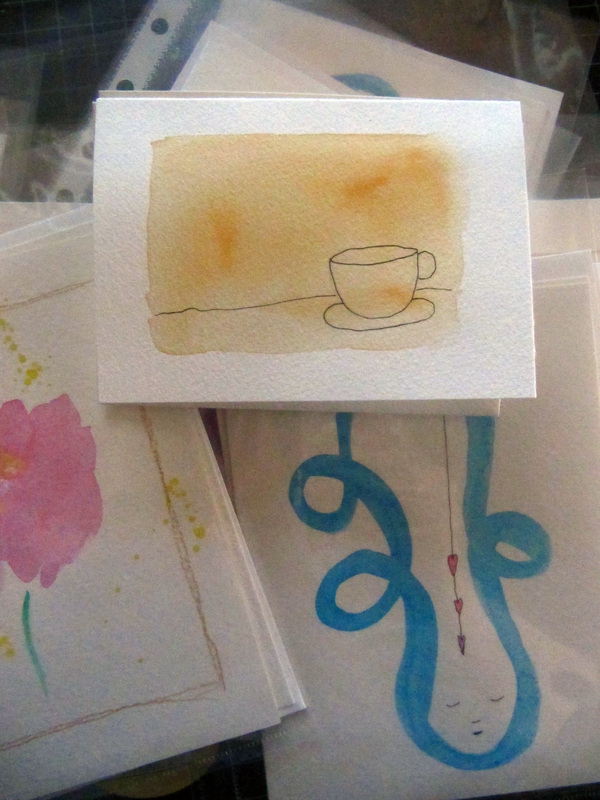 And, in fact, I’ve made pieces for those who have requested it and been paid a bit (a little bit) of money in return. But there’s more to it than that, isn’t there? My hesitation is about “turning play into work.” It seems like just the other day I wrote about how making art needs to be a peaceful, joyous exercise for me. 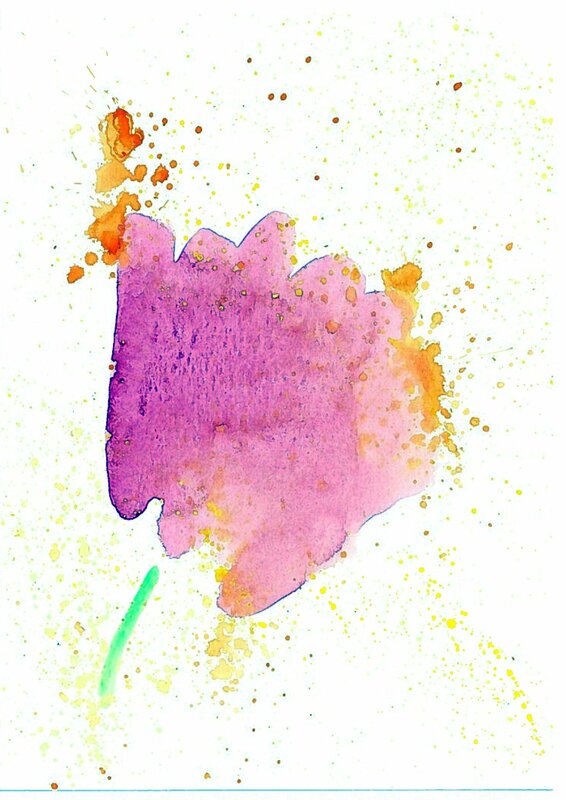 Will I lose that if I start creating artwork for sale? Will it suddenly seem more like a chore than a choice?